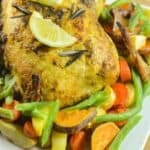 Lemon rosemary roasted chicken recipe – fresh sprigs of rosemary and zesty lemon juice coated with dairy free herb butter then oven roasted to a crisp. 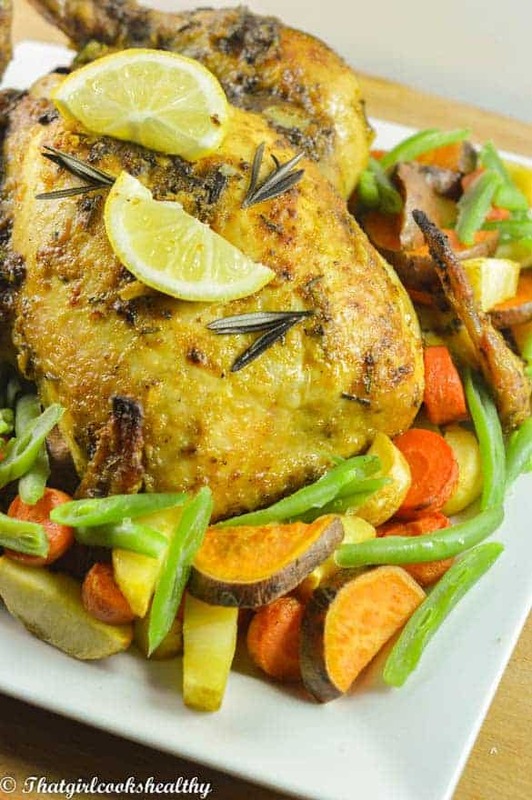 There’s something irresistible about roasted lemon rosemary roasted chicken. What is it that drives the nation into a complete frenzy after uttering those four words? The taste is A-mazing with a capital A. Let me be candid here, I am slightly late on the band wagon, so refrain from laughing. I actually first sampled this wonderful chicken in Canada. I recall visiting some relatives and ended up going over to a family friend’s house, where she offered me some chicken. Admittedly I prefer chicken breast, but it would have been bad etiquette to decline such a gracious gesture. My apprehensiveness was met with overjoy, the chicken was so delicious, but the bizarre thing was I didn’t move forward with my own rendition until this year. By the way, were talking about my initial discovery being 3 years ago (I know, I know I’m clinically insane). An abundance of lean protein (so succulent, zesty, juicy with a crispy exterior). High level of protein actually help to keep you feeling fuller for longer. 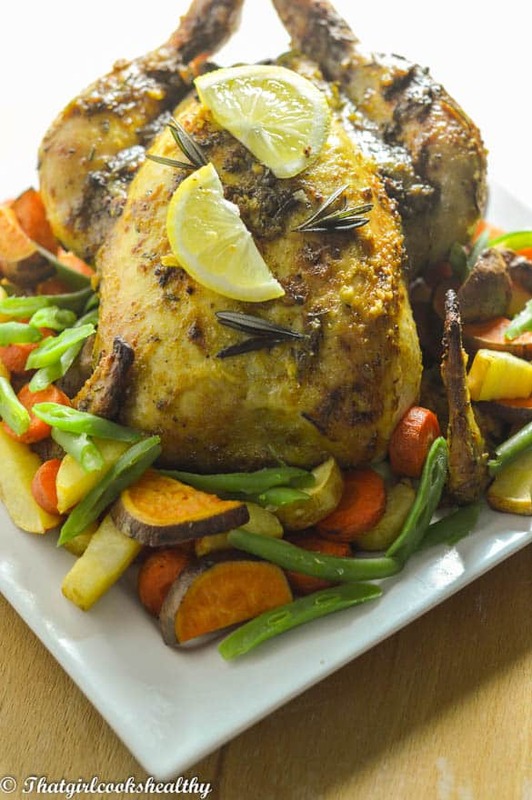 Most of the flavour derives from the lemon rosemary and garlic trio. I generously applied some himalayan pink salt and black pepper to the entire bird, cavity included. Another thing I should highlight, do make sure to stuff the cavity too, yes I know it is awkward inserting a hand inside a gigantic chicken just envision that wonderful moist, crispy lemon rosemary chicken once cooked, still not convinced? Well there’s nothing more I can do to prove otherwise. Baste the chicken 45 minutes into roasting, I recommend doing it then because you want the skin to crisp up first of all. If you do it too early the skin won’t become crispy at all. In all this recipe isn’t difficult although the size of the chicken may be intimidating. The proverb “practice makes perfect” certainly springs to mind, after cooking this bird a few times, with time it will become much easier. **Coming from a Caribbean background. I was raised traditionally to rinse ALL meat with a combination either salt and lime/lemon or vinegar. The purpose of this is to eliminate all of the slime and impurities which inhabit the meat. I made sure to purchase organic chicken as opposed to some random run-off-the-mill bird. The butter featured in this recipe is my homemade dairy free butter, paired with fresh sprigs of rosemary, garlic and lemons. Start by grating the three lemons in order to extract the zest. Add the garlic, olive oil and chopped rosemary to the melted butter and stir. Mix the pink salt and black pepper together and begin to apply the seasoning to the exterior of the chicken, be generous and really massage the salt and pepper into the skin. Be sure to work your way inside the cavity too. Brush the butter inside and outside of the chicken. Stuff the cavity with the garlic cloves, lemon(s) onion and rosemary. 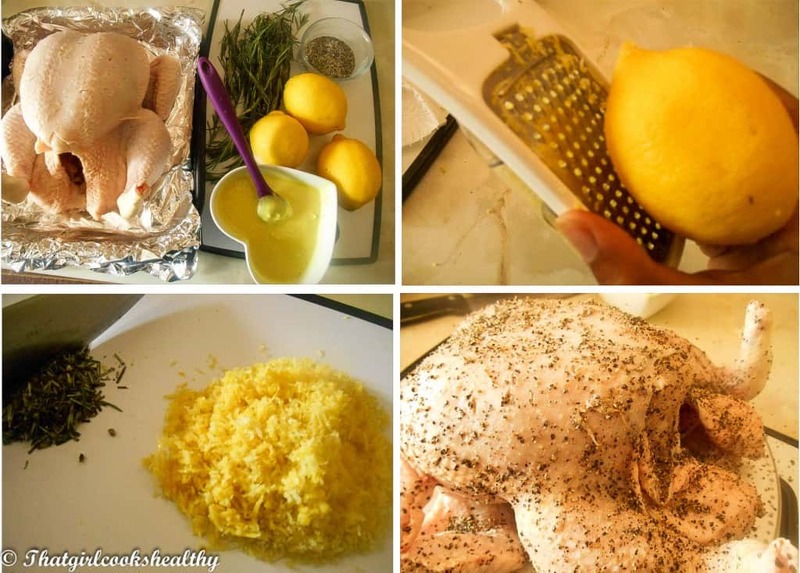 Squeeze the juice of the lemon over the entire chicken. Tie the legs together with a piece of roll up foil or string (most birds are sold tied, so reuse the string). Place the big bird onto a foiled wrapped roasting tin. Roast in the oven for an hour, about 45 minutes into the cooking process. Take the chicken out of the oven and baste thoroughly. Return to oven and cook for a further 15 minutes. Once cooked, set aside and serve with potatoes and vegetables. Ensure to baste the chicken for flavours to fully permeate. Use the remaindering extract from the cooked chicken as gravy when serving. I recommend using my dairy free butter recipe, however feel free to use alternative. Lemon and rosemary is my favourite seasoning for chicken as it is so simple, but so full of flavour. Haha glad I sparked your appetite. Do keep checking in for new recipes or you can always subscribe to my website. Yummy! I can smell it form here:-)! Thank you so much for this mouthwatering article. Now I am craving for one. Yummy! I can smell it from here:-)! Thank you so much for this mouthwatering article. Now I am craving for one. Can’t wait to try it. A video tutorial can be a big help. Thank you! I’m actually working on composing videos tutorials for some of my recipes.